10 Toddler Breakfast Ideas to inspire your busy mornings! Mix and match these mostly healthy, always delicious kid favorites for a great start to any day. As the mother of a toddler (and a kindergartener), breakfast is, unquestionably, The Most Important Meal of the Day. I cannot predict what my kids will eat (or not eat) the rest of the day, but I know I can get them to eat a solid breakfast. 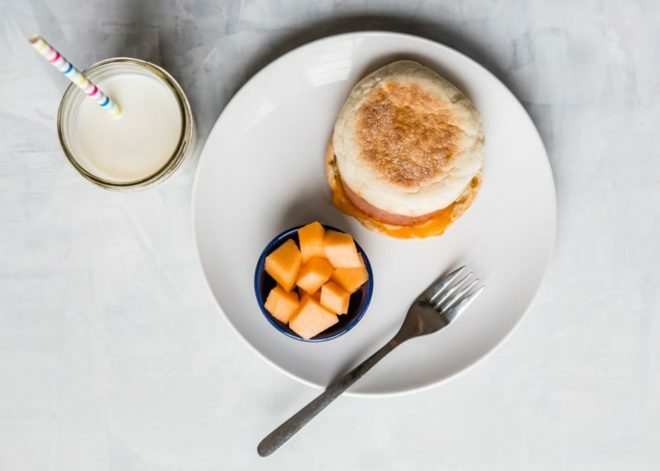 Mix and match these 10 Toddler Breakfast Ideas to guarantee a nourishing start to your child’s day. And a bit of sanity to yours. What can I feed my fussy toddler for breakfast? What any given toddler will eat is a mystery. However, from this list you will have a bunch of new ideas you can try out. Most, if not all, are healthy too (depending on your exact definition of “healthy”). Turkey sausage is one of the rare poultry options that I like as much as the full-fat version (turkey pepperoni is another favorite). I added clementine slices (or substitute any orange) for sweetness and some toasted oat cereal. If your child is coordinated enough, pour the milk into the bowl to enjoy the cereal the traditional way! Running behind? Toss the cereal into a bag and take it on the road for a quick snack. 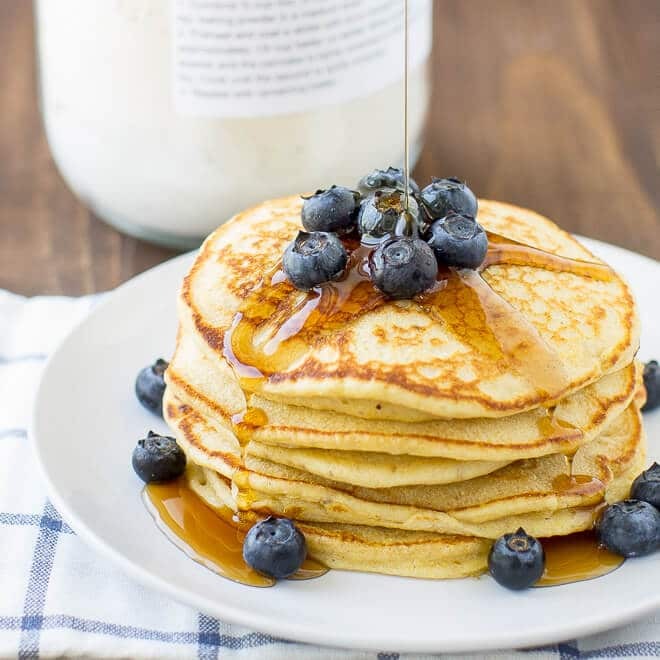 If you cannot find the energy to mix up a batch of pancakes from scratch in the morning (and if you’re reading this post, you probably have a toddler, and therefore you definitely DON’T have the energy), give yourself a head start with a Healthy Homemade Pancake Mix. 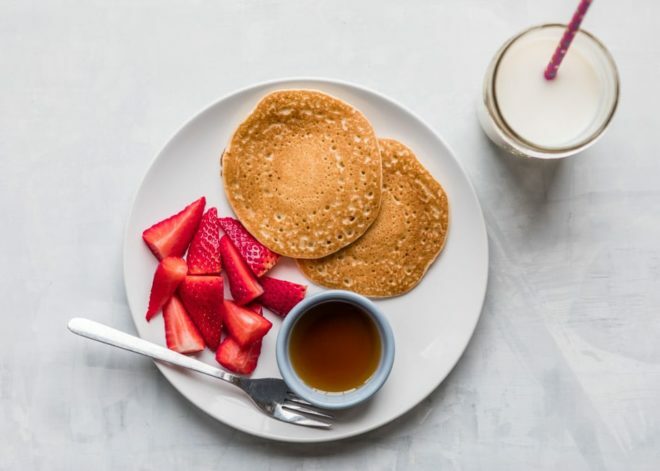 Top with butter and/r pure maple syrup, then serve with a side of fresh strawberries for an easy, toddler-pleasing morning. In my house, pancakes = fewer tantrums. Everything is better with cheese (says the girl from America’s Dairyland) and your toddler thinks so, too. 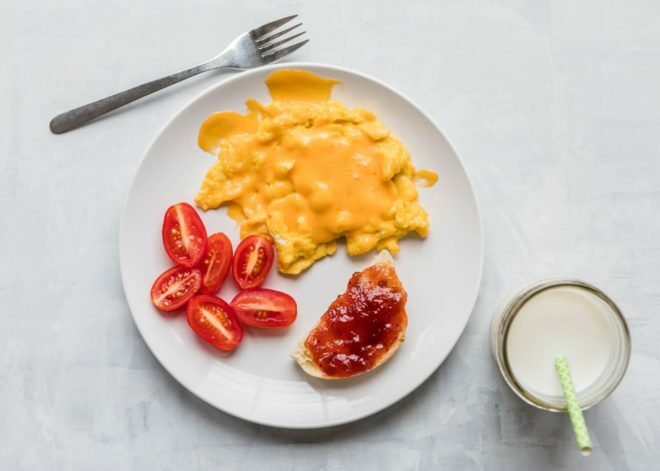 Even a tiny sprinkle of shredded cheese might be all it takes to convince your toddler that eggs are a good idea in the morning. As for the grape tomato halves… my toddler loves these. Yours might not. That’s okay. Serve with a small piece of toasted English muffin and strawberry jam. 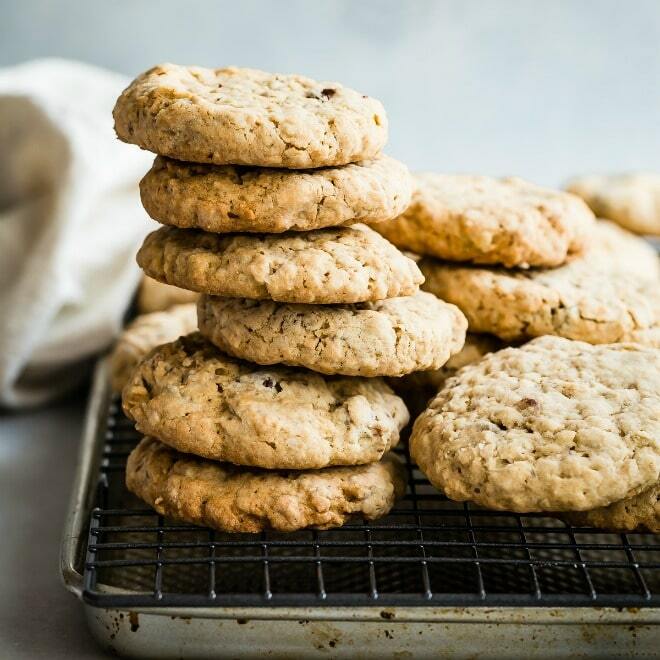 This is a favorite snack in my house but it doubles as a quick breakfast idea, too. Blend some 1/2 banana and 4 fresh or frozen strawberries into 6 ounces of milk for a sweet and satisfying toddler-sized smoothie. Then call it dessert! 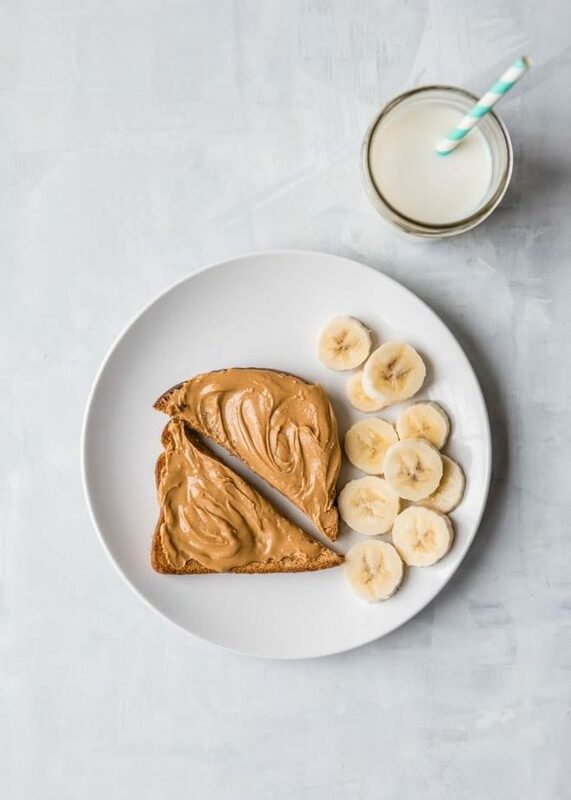 Peanut butter toast with bananas on top is an obvious breakfast idea for anyone except a toddler. The banana slices must be on the side: Always on the side! No questions asked! If you start your child off eating wheat toast from the beginning, they won’t even want squishy white bread as they grow up. It worked for me when my mom did it! Turkey bacon often tastes and looks like a ham slice. For toddlers, that’s good! The pumpkin muffins can be made on a weekend for an easy breakfast or snacking idea all week long (add in a teaspoon or two of chia seeds or ground flax if you want to). 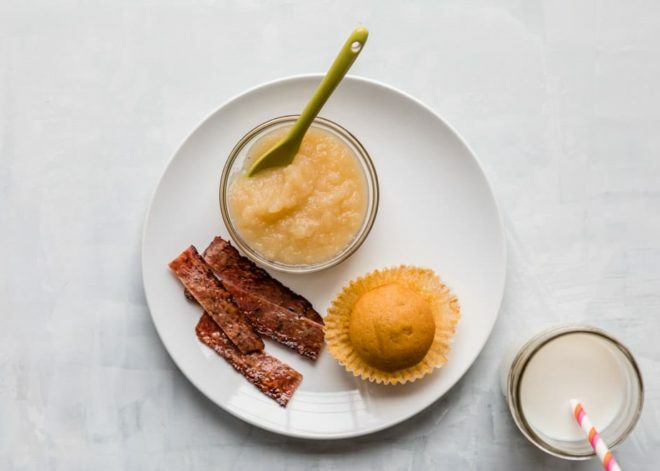 Applesauce completes this breakfast of tiny champions. This is another “assembly” breakfast idea that requires no actual cooking. Keep the components separate at first in case your toddler doesn’t like everything mixed together (mine doesn’t). Either homemade or store-bought granola works here. Substitute your child’s favorite fruit of choice if necessary! Possibly the easiest breakfast idea yet, and that’s saying something! (None of these are rocket science). 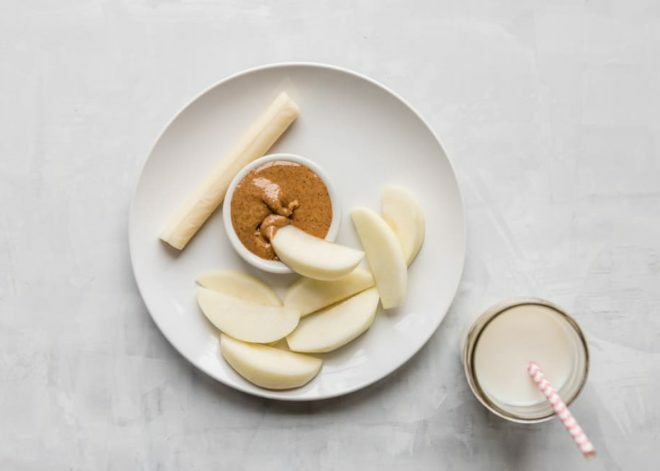 Almond butter is surprisingly delicious when you spread it on apple slices (my toddler prefers a cup for dipping). 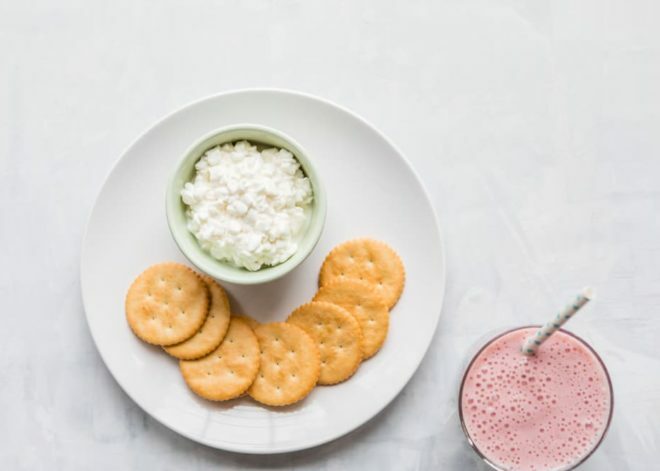 Wash it down with a glass of milk and add a piece of string cheese on the side. 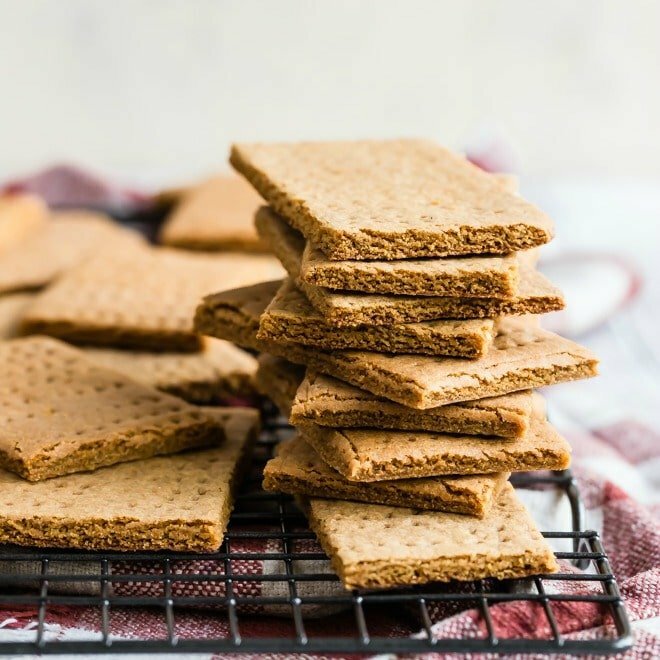 Super simple, and it also makes a great snack idea! Obviously regular bagels work just as well here (but maybe just start with half of a bagel depending on the size of your toddler’s tummy). 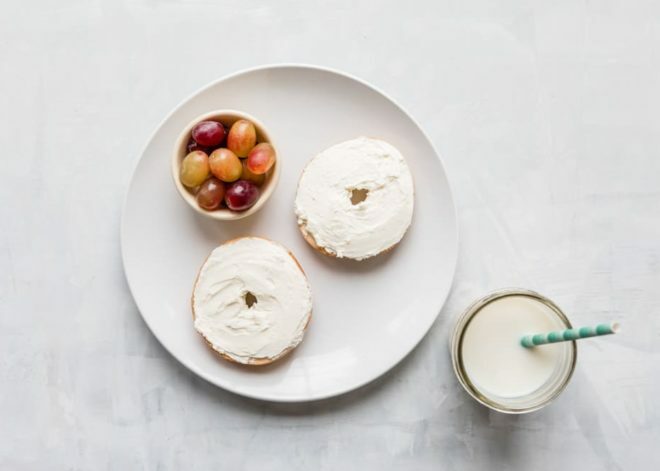 Spread the bagel with thick petals of cream cheese and serve with grapes (halved lengthwise if necessary). The breakfast sandwiches can be customized based on what your child likes or you have on hand. My kids love either Canadian bacon or sausage patties (with cheese, of course). Toast the English muffin first. 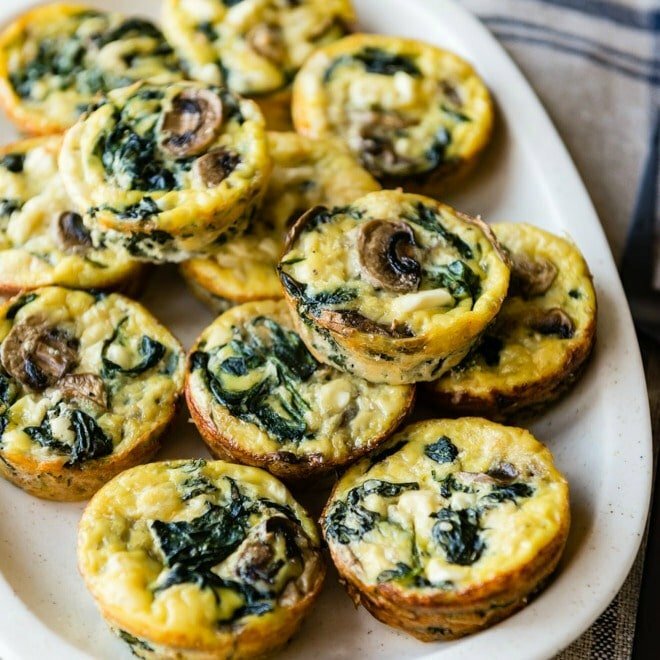 Save these Toddler Breakfast Ideas to your “Breakfast” Pinterest board! Ingredients are provided so you can print the list. This is a great post. Knowing how difficult it can be just to get a toddler to sit down to eat, there are some great tips here. Um, best post ever!! As you know we have twin toddlers, and I am so guilty of getting into ruts with our meals. Definitely pinning this for future inspiration!! You have such wonderful ideas! 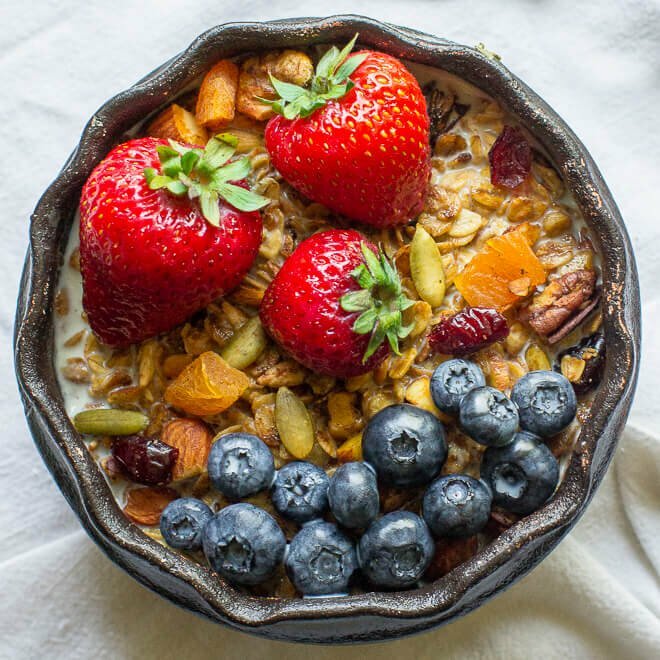 I will definitely be putting some of these ideas in our breakfast rotation. My toddler has a lot of food allergies, though, so I have to substitute some things. Thank you! I hear you on the allergies! My son was allergic to dairy until he was two, that definitely complicated things. But luckily he grew out of it. Wishing the same for you. Thanks so much for your comment! It’s always nice to share ideas on how to keep our kids fed (with something other than goldfish crackers and fruit snacks!). Congrats on your baby, I have two toddlers and they love all of these save the cottage cheese as we don’t have it. Eggs can be an easy fix at lunch or dinner if they get picky too. We also love colorful IKEA dishes! Did you do a lunch one? Nothing comes up when I search. 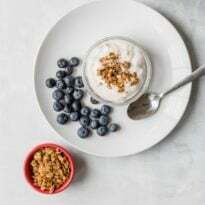 Your blog is awesome and this breakfast list has been perfect for our family. I would love to have a similar lunch one to follow! Hey Wendy! Rats, I haven’t made the lunch one yet. I need to! I’m sorry! I have a list of the recipes, I just need to get it together. Thanks for your feedback! Okay… these are awesome ideas!!! Have you thought about doing something like this for lunch or dinner!?!? Super helpful! Thank you for this post!!! 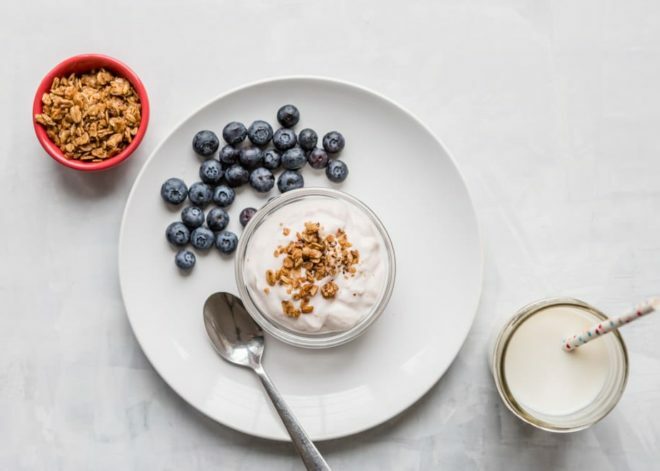 As a first time mom, it’s hard to find healthy ideas for breakfast….this helps! Now for veggie dinner ideas my toddler will like. She’s not a meat eater. Hi Sara! Believe me, after baby #2 getting kids to eat healthy doesn’t get any easier… LOL! But I know what you mean. 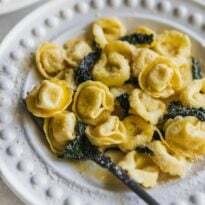 Every kid is different, but my kids (ages 1 and 4) are pretty good with things like stir-fries or soups that have veggies in them, cooked and soft and not necessarily noticeable. But it’s HARD! It’s so hard. Good luck!! Hi Margaret, I have words labeling each picture. The only veggies that appear in this post are grape tomato halves on the plate of the scrambled eggs with cheese. Everything else is fruit. Am I answering your question? I hope so! Thank you! 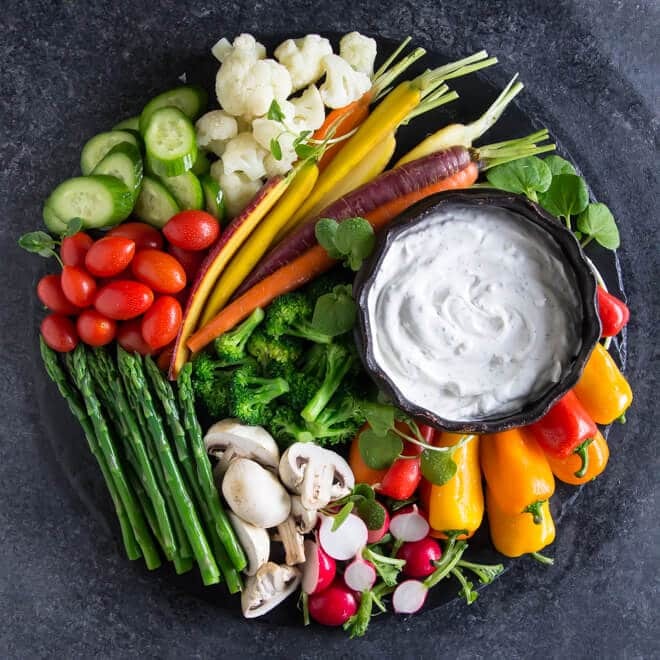 Thinking it might be better to have just one source of dairy and more veggies. Good ideas, regardless. I love this post! The foods listed are very simple and the meals are easy to put together! I struggle with thinking outside our normal breakfast of pancakes or oatmeal! Thanks again! You are so welcome Dyticia! It’s just a starting point for new ideas if nothing else. :) Take care! Just love this post! 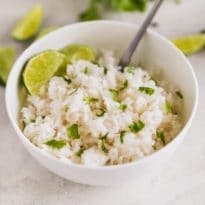 Simple healthy ideas that have been so well received by my two girls. Would love a lunch plan just like this if you ever have a chance. Thank you so much! What turkey sausage do you use? I have picky grandkids and your ideas sound great and will definitely try it. Any chance there’s a way to print i want to share with the nanny!!!! Where are those kids utensils from? They are beautiful. Hi Mira, thank you! Yes they are so nice! They are Oneida brand, the Chateau pattern. If you go to Amazon and look up “Oneida kids chateau” you’ll find it there. And they feel so nice in your hand, it’s really high quality stuff. I have a set for each of my children. It’s lovely! Thanks and take care! These are great ideas! I see that you included the suggestion to halve the grapes if necessary but I just wanted to suggest maybe letting your readers know grapes are a choking hazard when they’re whole. There are a lot of first time parents out there who don’t know this and I was one of them myself :) I’m so excited to try these! My daughter is 15 months and like you said, it’s a mystery what she’ll eat from day to day haha! Thank you! Omg! I am so thankful for this post. My toddler is such a picky eater. She’s not a big fan of pancakes and won’t have eggs at all. Sometimes I find myself struggling with ideas of what to feed her. These recipes look awesome . I can’t wait to try them. 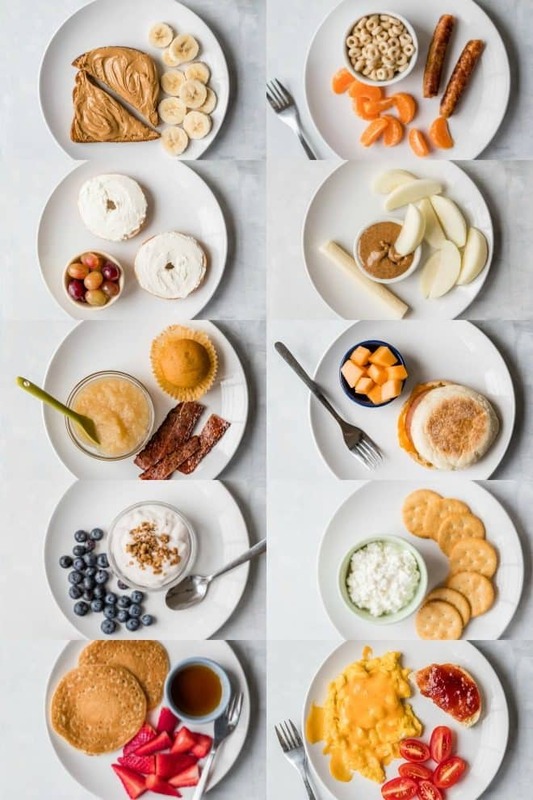 This post came up on my Pinterest feed and it looked like what we have for breakfast. Then I realized why. The new pictures look perfect! Any chance you’ve done a lunch post? This breakfast rotation totally changed my life, but I still hate making lunch. Thanks! This is amazing!!! Can you please do a lunch and dinner version!?!? Thank you Jena! The lunch version is in development now. :D I appreciate your support!!! And yes I’ll add a dinner version to the list! 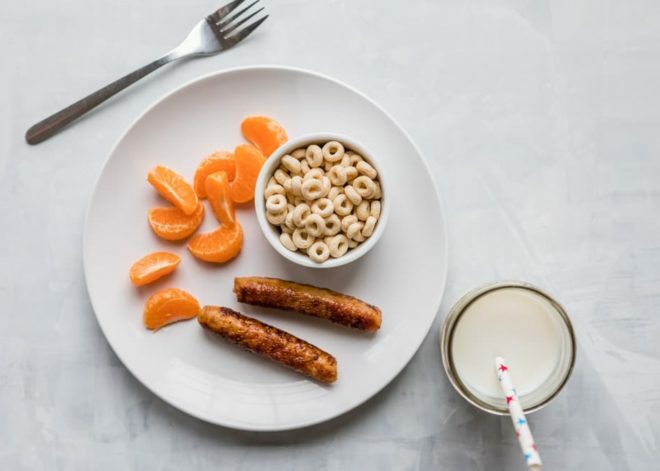 Hi, I found this photo of the lead example with 10 plates on a Google search for toddler breakfasts. Great ideas, always good to get some ideas on a sleepy morning. Thanks for sharing. Would it be possible to change the grape photo to them sliced lengthways instead of whole grapes? Someone may see the photo on Pinterest or Google and not read the context and copy the idea of giving whole grapes.